Are Tomato Ladders Better than Cages? Tomato ladders are sturdy metal tomato supports that offer some of the advantages of tomato cages but are typically stronger and taller than cages. They look like two sides of a triangular cage. They are superior to simple tomato stakes because they don't need as much vine tying and the cross members provide a place to support heavy vines laden with fruit. Because ladders are the same width at the top and bottom it's possible to buy ladder extensions that allow extending the height of the ladder to extend upwards to nearly seven feet, depending on the manufacturer. 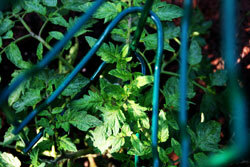 Ladders can be set in place either before or after the tomato plants are set out. They are attractive and very sturdy and durable. The main disadvantage of tomato ladders is their higher cost compared to other tomato supports. I have read through enough customer feedback about these ladders to get a good sense of what gardeners consider the pros and cons. Because they are heavyweight they should last for many seasons. They are among the pricier of the vertical tomato supports. The standard ladder is a little over 4-feet tall--too short for most vigorous tall growing indeterminate tomato varieties. You may want to buy ladder extensions for an added cost which will extend the ladder height to about 6-1/2 feet tall. For better support of large vines some gardeners are reporting that the 7-inch arms of the V-shape aren't wide enough and wished they were longer. Some have resorted to using two ladders per plant. For some plants you may have to prune your tomato plants to one main stem in order to support them adequately with one ladder. Of course the same is true for most vertical support methods except for large cages. If you are willing to tie up all the branches then pruning won't be necessary.